Welcome to another month of the Storytellers Blog Circle, where you can visit the blogs of multiple Offset artists to learn about their storytelling approach to photography. 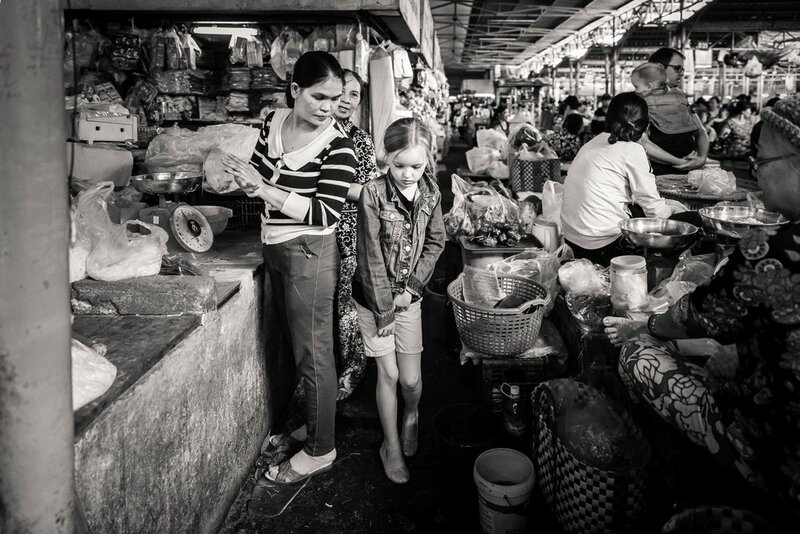 This image really captured my memory of a family trip we took to NhaTrang Vietnam, and the feel of the local market for my family. Continue reading to see my settings for the image and why I chose them, as well as my thoughts on the black and white edit of the same photograph. I also have included the full series of images from our cooking class at Red Lantern Restaurant in Nha Trang. It took a ton of parenting juggling to keep everyone cooking, ensure no one burned themselves or cut off a finger, all while taking photos...so not EVERYTHING was fully documented, but this is a memory we won't soon forget. I do appreciate the texture and timelessness provided by the monochrome conversion, but I honestly love the color edit more. I believe that the wide range of colors really helps the scene to feel more alive, and you can garner a greater sense of my daughters intrigue and concentration in the bustling surroundings. Also, my ISO was quite high at 4000, and I'm thankful that my shutter speed of 1/200 was adequate to freeze the movement of the moment. My daughter was walking quite slowly as to avoid the water on the floor (you can use your imagination to think of what was in said water - she could see the various seafood, frogs, and other options that could be there, so she was moving quite carefully!) which is the only reason that this SS was sufficient. Also, I think that the unique tone to the colors in the image are also partly due to the elevated ISO of 4000. When a higher ISO is used the colors can sometimes be a bit less saturated, or appear a bit muted. I believe that this occurred a little bit in this image but I think that it's quite perfect for this setting. Ultimately for the storytellers blog circle series we try to use one single image to discuss how it was taken and it's storytelling component...and honestly quite often I may only have one or two frames that I love from an event. It just so happens that the above image is part of a much longer story about my family going to a cooking class in Nha Trang, Vietnam. We start out at the restaurant, travel as a group to the local market to buy our ingredients fresh, and then cook together back at the restaurant. I wanted to share a bit more of our adventure here for your enjoyment. I'd love to hear your thoughts in the comments about the color and monochrome edits on my feature image, if you prefer one over the other, etc. Would you have picked a different image to tell the full story of our little cooking adventure? Now, don't forget to follow the blog circle around to learn from these other amazing storytelling photographers. Up next in the circle is Blimie Tee. Check out here amazing work HERE. Sign up to receive client news, specials, and to learn where I'm traveling next and booking sessions! Servicing Portland, Oregon & surrounding areas. Available for Global Travel.